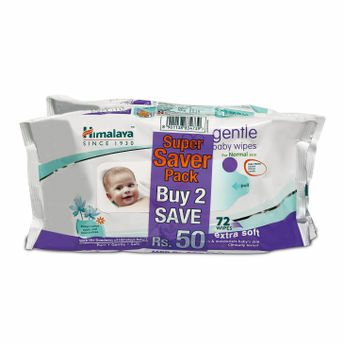 Make your baby's bottoms squeaky clean with Himalaya Gentle Baby Wipes! Infused with the goodness of aloe vera and Indian lotus extracts, these baby wipes are mild enough to soothe your baby's bottoms during a diaper change. They can also be used to gently cleanse your baby's skin and keep it clean and fresh for a long time. The natural ingredients in these wipes, ensure that the baby remains bacteria-free throughout the day. Ideal to carry during travelling. Aloe Vera: A renowned herb in Ayurveda, aloe vera is used in a host of dermatological remedies. A natural skin soother, the plant extract leaves baby's skin feeling fresh and moisturised. Indian Lotus: It contains natural conditioning agents, which keep baby's skin soft and supple. Explore the entire range of Cotton Buds, Balls & Wipes available on Nykaa. Shop more Himalaya products here.You can browse through the complete world of Himalaya Cotton Buds, Balls & Wipes .